Thanks everyone who participated in the Dec 21st – 22nd Freebie Jubilee! I am honored to have worked with an amazing group of 9 other authors who helped make the event a success. To those who downloaded our books, I’m confident you won’t be disappointed. If you enjoy the reads, please fee free to comment, spread the word and come back for more. Ten talented authors. Twelve FREE eBooks. One incredible holiday event! There are twelve amazing novels listed (December 21st and 22nd) for FREE on Amazon! If you haven’t already snatched up these great reads, now is a fantastic time to treat yourself for the holiday season! For just two days, Closed Doors, A Trilogy will be free through the “FreebieJubilee” Giveaway! 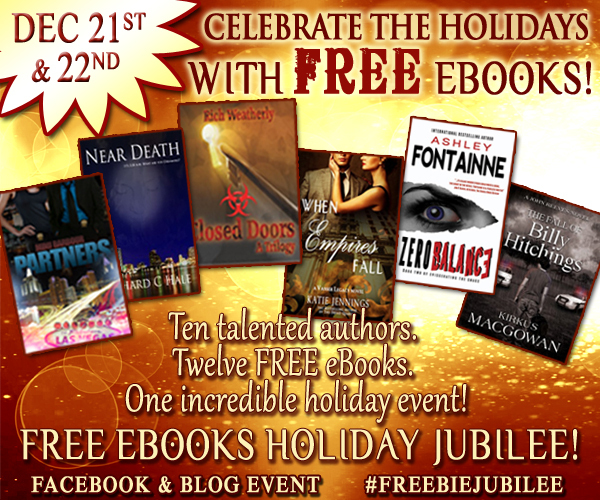 Rich Weatherly has joined with the following authors to offer their books for free on December 21 & 22 only! For details on the event, click the following: December Holiday eBook Giveaway & Soiree.